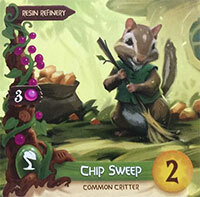 At game end, worth 1 point for each of your leftover resin and pebbles, up to 6 points total. 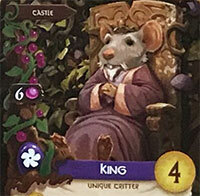 Discard up to 5 cards from your hand, to gain 1 point token for each card. When played and during Production, gain 2 twigs for each Farm in your city. When played and during Production, activate any 1 green Production card in your city. We know what you are thinking, and we do not recommend it. By the time the poor thing caught his tail, he'd burned a hole straight through our table. Do not ask him to do that. 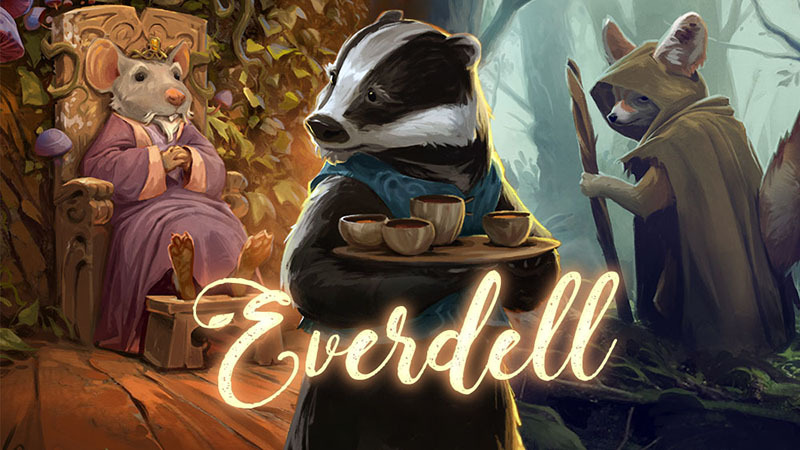 When played and during Production, you may pay up to 3 berries to gain 1 point token for each berry. 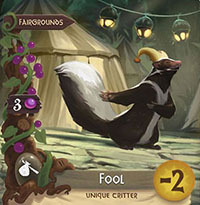 The Fool is played into an empty spot in an opponent's city. Stinks, don't it? 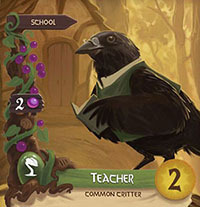 Solo Game: Rugwort can play the Fool into your city. If you play the Fool, discard the Fool and remove any 1 card from his city. 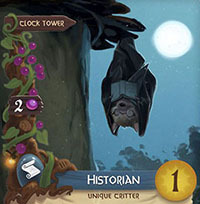 Draw 1 card after you play a Critter or Construction-basically every time you play a card after you have this Historian, you get to draw a card. Shares a space with a Wife, so combined they only take up 1 space in your city. 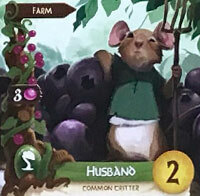 If you have a Farm in your City and this Husband is paired with a Wife, then this card gives you 1 of any resource when played and during Production. May only share a space with 1 Wife. 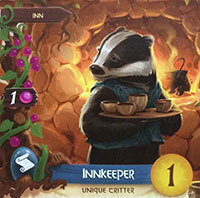 When you play a Critter, you may discard this Innkeeper from your city to decrease the cost of the played Critter by 3 berries. You do not gain the 3 berries. 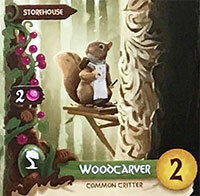 This card cannot be combined with any other card-playing abilities-including the Inn, any forest tiles that allow you to play a card, or cards like the Dungeon. 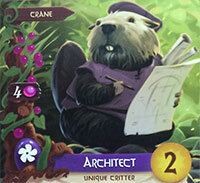 When playing a Critter or Construction, you may replace 1 of any resource in the cost with 1 of any other resource you have. 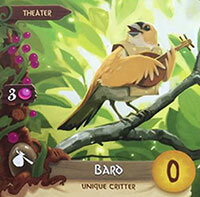 Example: If a card costs 2 berries, you may pay 1 berry and 1 twig instead. 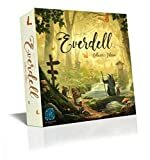 At game end, worth 1 point for each basic Event, and 2 points for each special Event you have achieved. When played and during Production, you may copy any 1 green Production card in any opponent's city. 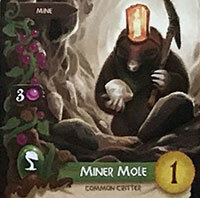 Basically the Miner Mole becomes that card for a moment-so if copying a General Store, you would receive 2 berries if that opponent also had a Farm in their city. 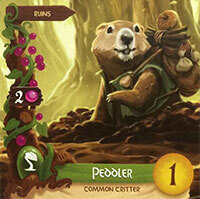 Solo Game: You may copy any green Production card in Rugwort's city with the Miner Mole. 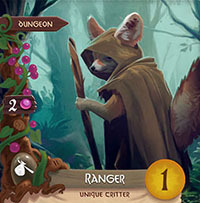 When played and during Production, you may give up to 2 berries to an opponent to gain 2 point tokens for each berry you give. Also unlocks the 2nd Monastery room. When played and during Production, you may trade up to 2 of your resources for 2 of any other resource. Trade with the general supply, not other players. 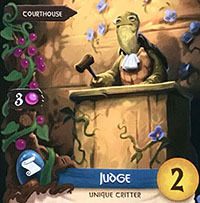 When played, reveal 2 cards from the deck. You may immediately play 1 of these worth up to 3 points, for free. Discard the other. 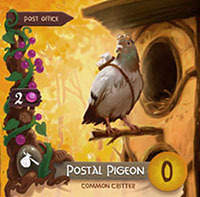 Solo Game: If you play a Postal Pigeon and activate its ability to play another card, that counts as you playing 2 cards, so on Rugwort's turn he will play 2 cards. 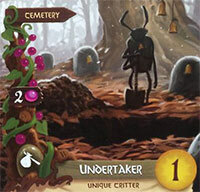 When you place a worker here, you may play any card from your hand or the Meadow cards worth up to 3 points for free. 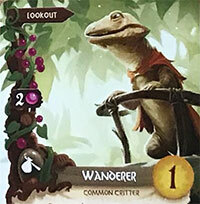 This refers to the base points of the card, not bonus points. When played, move any 1 of your deployed workers to a new location, following the normal worker placement rules. Also unlocks the 2nd Dungeon cell. 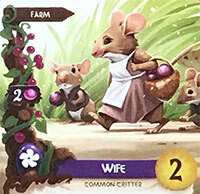 When played, gain 3 berries. 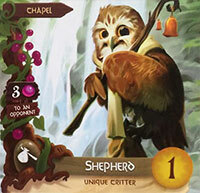 Also gain 1 point token for each point token on your Chapel. 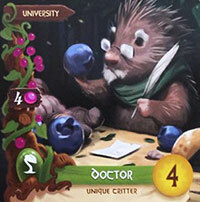 Gain 1 berry after you play a Critter into your city. 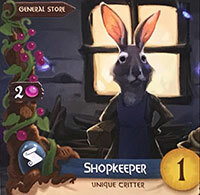 Do not gain a berry for playing this Shopkeeper. 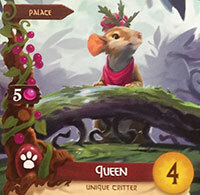 When played and during Production, draw 2 cards. Keep 1 of them and give the other to any opponent. 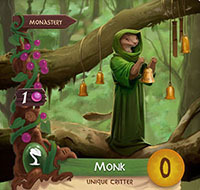 When played, discard 3 of the Meadow cards, replenish those 3 cards, then draw 1 card from the Meadow cards into your hand. Also unlocks the 2nd Cemetery plot. When played, draw 3 cards. Does not take up 1 of the 15 spots in your city. Shares a space with a Husband, so combined they only take up 1 space in your city. At game end, worth 3 points if paired with a Husband. May only share space with 1 Husband. 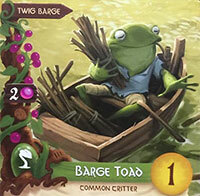 When played and during Production, you may pay up to 3 twigs to gain 1 point token for each.